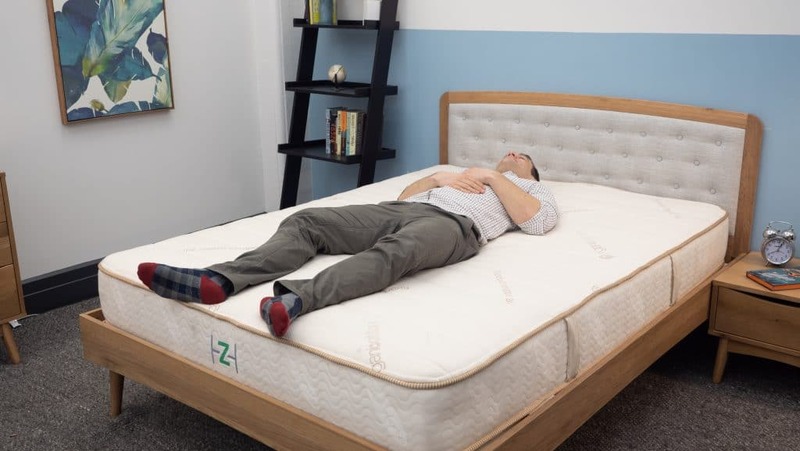 If you’ve been flip flopping about which new mattress to buy, you might want to consider the flippable latex mattress from all-natural favorite Zenhaven. This bed features a convenient adjustable firmness level, lush latex layers, and eco-friendly materials that are as easy on the spine as they are on the environment. But is the Zenhaven truly the haven it claims to be? I won’t know how comfortable this mattress really is until I put it to the test to figure out how it feels, how it sleeps, and whether or not it could be the mattress of your dreams! Founded in Austin, Texas in 2011, Saatva has grown into one of the most successful mattress retailers in the world. 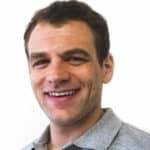 The company burst onto the mattress scene with a traditional innerspring bed sold direct to consumers online, then branched out with an eco-friendly memory foam version called Loom and Leaf. 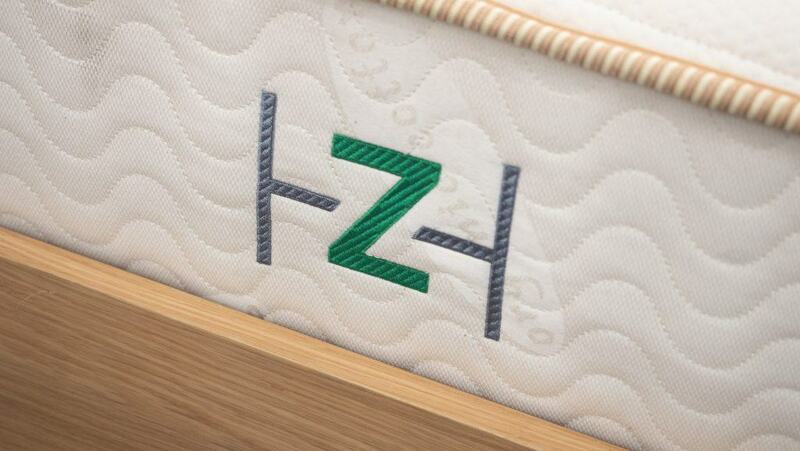 The Zenhaven is its all-natural Talalay latex brand. Zenhaven now offers free white glove delivery, installation, and mattress removal, making the experience of buying a new mattress and disposing of your old one relatively painless (for both you and the environment). It’s also worth noting that the Zenhaven recently made my list of the best all-natural mattresses. 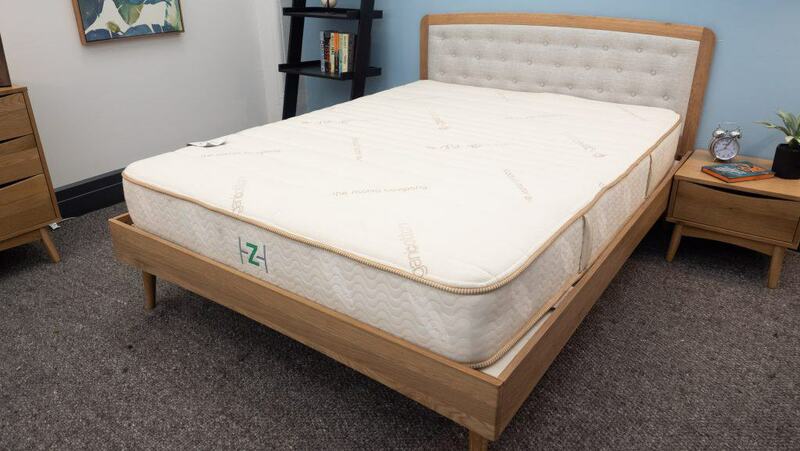 The Zenhaven mattress consists of 100% natural latex, organic cotton, and wool, layered around a latex base. Designed to be flipped and adjusted to your individual firmness needs, the bed offers two different firmness levels on either side. The softer side, called “Luxury Plush,” features a soft, luxurious feel. Flip the mattress over and you’ll find yourself experiencing the “Gentle Firm” side, which is a bit more supportive and, according to Zenhaven, 18% firmer than the Luxury Plush side. To see how all these flippable layers come together, let’s dive in and explore the Zenhaven up close! Cover – The cover is woven with organic cotton, quilted with 100% organic New Zealand wool, giving this mattress a soft and breathable feel right off the bat. This combo of natural cotton and wool make for extra cushioning and coziness. Luxury Plush Layer – The plushest layer of the bed consists of 1.5 inches of soft, supportive Talalay latex. 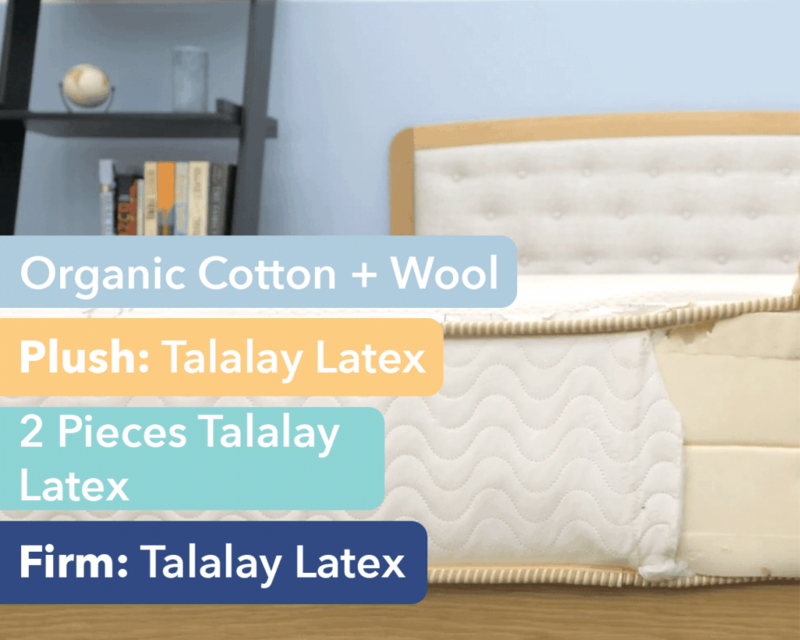 Unlike Dunlop, Talalay latex has a reputation for being smooth and luxurious to the touch, while still being bouncy and supportive enough to help keep you positioned “on top” of the bed, rather than in it. Core – Two thick layers of (you guessed it) Talalay latex are compressed together to form the bed’s dense, supportive center. The two layers measure three inches each, so together provide about a half-foot of structural support. The use of latex foam in this foundational layer gives the bed plenty of bounce and buoyancy. Gentle Firm Layer – To arrange the bed in its firmest configuration, you’ll want to stack this layer on top. The Gentle Firm layer is composed of 1.5 inches of firmer, more supportive latex, providing a bit more lumbar support and ensuring proper alignment of the spine. The firm setting is likely going to feel a bit less cozy than the super soft Luxury Plush side, and is not as pressure-relieving as other materials (like memory foam), so you’ll notice less sinkage on first contact. HOW FIRM IS THE ZENHAVEN? Now that we’ve taken a closer look at the construction of the Zenhaven, let’s chat about the bed’s unique firmness and feel. With the bed’s Luxury Plush side up, I started off by applying some light hand pressure to the mattress and found myself immediately interacting with the soft organic wool quilted into the cover. While my hand sank a bit into the cotton and wool, the buoyant latex below kept me positioned on top of the structure. Since folks of different weights and sizes are going to feel firmness differently, I decided to enlist three other testers to help me scope out the Zenhaven’s firmness. To do this, we each took turns lying on the bed and gave it a personal rating. All of our personal ratings were then compiled on the graph below. 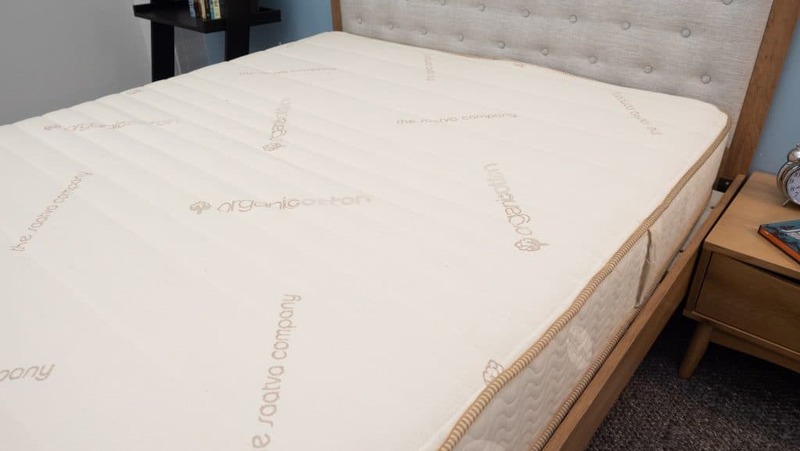 While feel is always going to vary from person to person, our combined responses should give you a general picture of the firmness and feel you can expect from this mattress. We had a wide range of responses to this bed, but ultimately landed on an average firmness rating of 6 for the Luxury Plush firmness level and 7.5 for the Gentle Firm setting. When compared to the industry standard of 6.5 for medium firmness, it seems this bed is just a bit softer than medium firm when adjusted to its softest configuration, and roughly a full point above medium when set up in the firmest configuration. I personally gave the Luxury Plush arrangement a 6/10 as I found it to be just a touch softer than medium firm. The bed offers some initial cozy softness and a slight amount of sinkage, but mainly provides a feeling of being “on top” of the bed, with plenty of bounce and support. Side sleepers will likely find this soft side adequate for some much needed pressure relief in the hips and shoulders, while stomach sleepers might find this soft side a bit too soft for their needs. Flipping the bed over to the Gentle Firm setting, I found the bed a bit firmer and gave it a 7/10. My weight was evenly distributed in this position, but compared to the soft side, I felt a noticeable uptick in pressure at the shoulder and hips. On my stomach and back I felt some nice support through the hips, as well as some immediate pressure relief in the lower back. Side sleepers will likely find this setting too firm, but the stronger support through the hips and lower body are ideal for back and stomach sleepers. 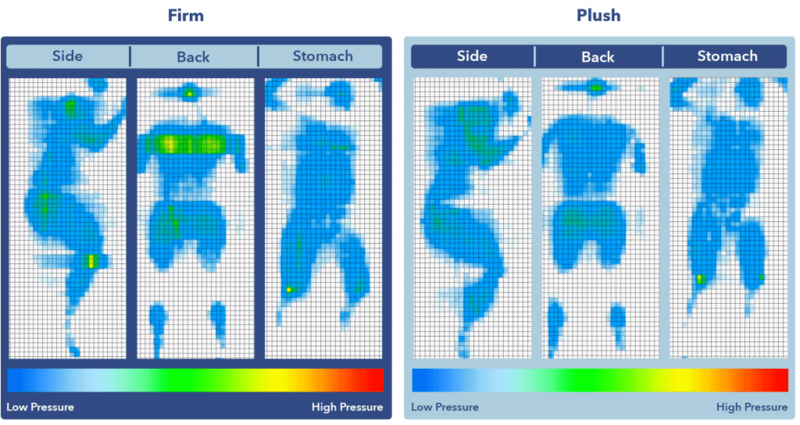 Another important component of feel is pressure, or more specifically where pressure points are likely to form while sleeping on a new bed. To help you visualize where these tension spots might crop up, I placed a pressure map on top of the mattress and stretched out on my back, side, and stomach. You can see the results on the image below where pressure is represented from blue (low pressure) to red (high pressure). Back – Lying on my back produced similar sensations with both firmness levels, and I honestly didn’t feel too much of a difference between the Luxury Plush and Gentle Firm configurations. I could feel myself sinking just slightly through the quilted cover into the top layer, where the latex naturally contoured to the curve of my lower back and provided some immediate pressure relief. Side – Turning onto my side, the difference between the Luxury Plush and Gentle Firm settings felt more obvious. Lying on the Luxury Plush side, I got some satisfying pressure relief at the shoulders and hips, typical problem areas for side sleepers. When the bed was flipped to the Gentle Firm setting, however, there was a bit more pressure in these areas, which you can see from the green spots on the pressure map. 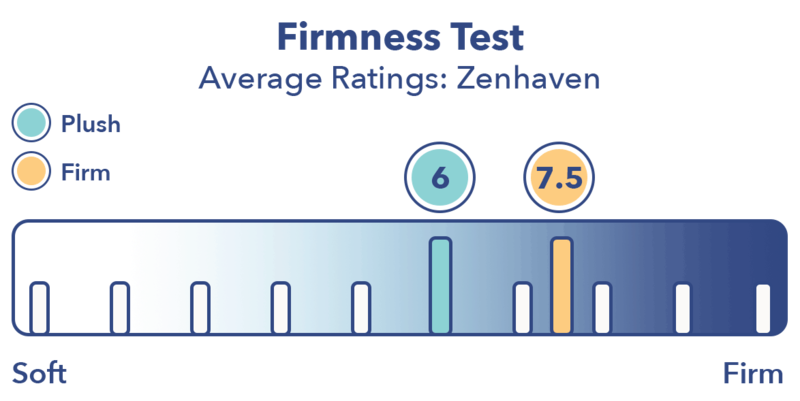 I’m not too surprised by this as strict side sleepers tend to prefer softer beds that fall within the 5-6 range on the firmness scale, and the Zenhaven falls squarely in the 6 range in its softer configuration. Stomach – On my stomach in the Luxury Plush setting, I began to feel a bit of discomfort as my hips sank out of line with my shoulders. Unlike side sleepers, stomach sleepers want a firmer bed that helps lift and support the spine and lower body. For that reason, I’d suggest that strict stomach sleepers orient the Zenhaven with the Gentle Firm setting on top. 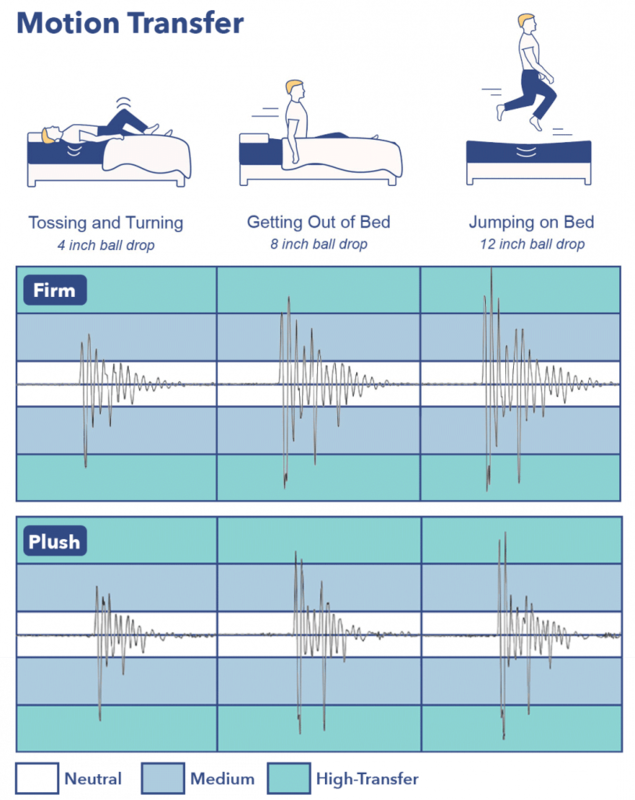 For those of you looking to share your bed with a partner, you’ll want to pay special attention to its motion transfer, or the amount of disturbance that travels across the mattress from one side to the other. If you’re a light sleeper and find yourself waking easily when your partner gets up in the middle of the night, motion transfer is a critical feature to explore. The Zenhaven displays extremely high motion transfer with both configurations, which tells me you’re likely to feel even small movements pretty easily with this mattress. Though the bounce from latex is great for keeping the sleeper positioned on top of the bed, it does unfortunately contribute to a lot of disturbance across the structure. Those of you who share a bed or wake easily might want to scope out a bed with more sinkage and lower motion transfer. Sinkage is what determines whether you feel like you’re lying “on” a bed or “in” it. A bed with tons of sinkage will relax or compress under your weight and make you feel like you’re lying “in” the bed, while a bed with minimal sinkage will stay taut and buoyant, making you feel that you’re lying “on top” of the bed. As you can see, both configurations produced similar numbers in the average range, with the firm side consistently displaying about a half inch less sinkage than the soft side. These results show me that the Zenhaven has average-to-minimal sinkage. This sinkage is to be expected from a bed made with dense layers of latex. Talalay latex, in particular, is known for its buoyancy, which is going to provide plenty of support and firmness, but not as much sinkage and softness as a synthetic material such as memory foam. Fans of firm support might love the minimal sinkage of this bed, while fans of memory foam will likely want to check out other options. Now that we’ve explored all the nitty gritty details of the Zenhaven mattress, let’s outline a few basic reasons this bed might be the perfect match for you, as well as a few pointers on who might want to keep looking elsewhere. Great bounce – Latex is known for its buoyancy, and this bed is no exception. Thick layers of bouncy material give this mattress plenty of overall support and help you stay feeling “on top” of the bed at all times. Sleeps cool – The absence of memory foam and the inclusion of breathable fabrics like cotton and wool mean this bed sleeps cool. 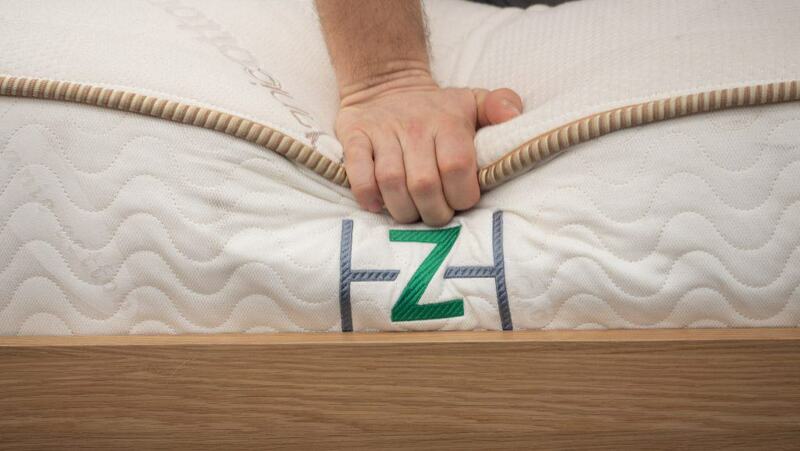 You’re not likely to run the risk of overheating or sleeping too hot with this mattress. 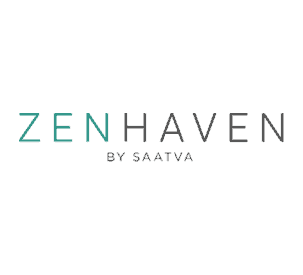 High-quality organic materials – Where the texture and feel of some all-natural beds can suffer because of low end materials, that is definitely not the case with the Zenhaven. American-made latex, organic wool, and organic cotton ensure the quality of this bed is top notch. Luxury Plush for Side, Gentle Firm for Stomach and Back Sleepers – This bed’s versatility means it can accommodate a wide variety of sleepers. The Luxury Plush side might be perfect for side sleepers looking for pressure relief, while the Gentle Firm side is just right for stomach and back sleepers seeking a little more support. High motion transfer – One drawback of this bed is its super high motion transfer, which can be felt through the bed’s ultra bouncy layers of latex. Folks who sleep light or share a bed might want to check out other options. No sinkage – Fans of sinkage will want to look elsewhere, as the Zenhaven’s bouncy latex layers are not exactly conducive to it. While this bed is buoyant and supportive, you won’t find the soft, sinkable feel of memory foam here. 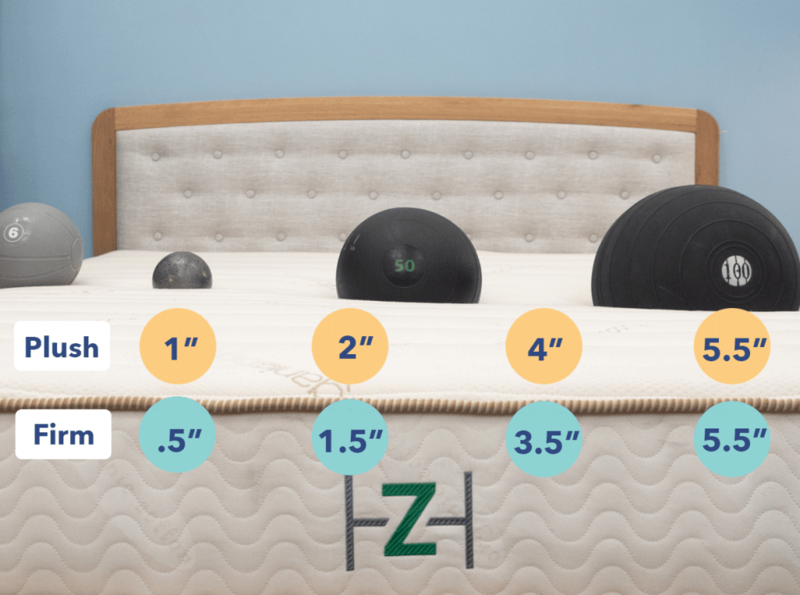 If you’re convinced the Zenhaven is the right mattress for you, the size and pricing information for the mattress are below.